Books in the library at Somerville College. The English side of the course offers you a choice of options covering a comprehensive span of literature written in the English language from its origins in Anglo-Saxon through to works produced in English-speaking countries across the world in the present day. The Modern Language study will give you practical linguistic training, encourage you to think coherently about language as a subject of study and introduce you to an extensive and fascinating literature and thought written in European Languages. 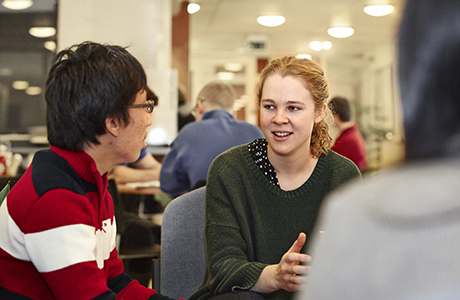 The English Faculty is the largest in the UK, and the Modern Languages Faculty is one of the largest, with teaching staff including major scholars in all areas of the respective subjects. Library provision at Oxford is excellent: all students have access to the English Faculty Library, the Taylor Institution Library (for languages), the Bodleian Library, including the Weston Library’s collection of manuscripts and rare editions and their own college libraries, as well as many online resources. The course is extremely flexible. In the first year you will do practical work in your chosen language and study a selection of important texts from its literature. On the English side, you will be introduced to the conceptual and technical tools used in the study of language and literature, and to a range of different critical assumptions and approaches. You will also do tutorial work on either early medieval, Victorian or modern literature. In the second year, a variety of options will be available. Work in your modern language will continue alongside the study of literature from a wide range of periods in English and in your language. The third year of this four-year course is spent abroad. On your return, you will choose from a range of special option papers in both English and Modern Languages, and in comparative literature. English and Modern Languages students spend a compulsory year abroad, usually in the third year. They may work as paid language assistants in a foreign school or do internships abroad, both of which provide valuable opportunities to develop career experience while improving language competence. The year may also be spent studying at a foreign university. Students are encouraged to spend as much as possible of their vacations in the countries whose languages they are studying. In addition to the possibility of Erasmus funding, extra financial support, including travel scholarships, may be available from your college and/or the faculty. Most students will have one or two tutorials a week as well as compulsory language classes. Typically, you will also attend three to four lecture courses per subject, which may cover different approaches to literary analysis, introductions to some of the texts or other content you are studying, or general cultural and historical content related to your degree. Tutorials are usually 1-4 students and a tutor. Seminar and language class sizes may vary depending on the options you choose or the language you are studying, but there would usually be no more than around 20 students and would often be much smaller. Most tutorials, classes, and lectures are delivered by staff who are tutors in their subject. Many are world-leading experts with years of experience in teaching and research. Some teaching may also be delivered by postgraduate students who are usually studying at doctorate level. To find out more about how our teaching year is structured, visit our Academic Year page. Introduction to English language and literature. All exams must be passed, but marks do not count towards the final degree. The options listed above are illustrative and may change. More information about current options is available on the English and Modern Languages websites. Papers will be examined by extended essays over the course of the second and fourth years, and by practical and written examinations at the end of your fourth year. Essential: Candidates are expected to have English Literature, or English Language and Literature, to A-level, Advanced Higher, Higher Level in the IB or any other equivalent. Candidates would usually be expected to have the language or languages to A-level, Advanced Higher, Higher Level in the IB or another academic equivalent. Essential: Candidates are expected to have English Literature, or English Language and Literature, to A-level, Advanced Higher, Higher Level in the IB or any other equivalent. Candidates applying for a non-beginners' language course would be expected to have an A-level, or academic equivalent, in that language. Beginners’ courses allow students to start studying one of these languages from scratch. All candidates must take both the English Literature Admissions Test (ELAT) and the Modern Languages Admissions Tests (MLAT) as part of their application. Separate registration for these tests is required and it is the responsibility of the candidate to ensure that they are registered. We strongly recommend making arrangements in plenty of time before the deadline. For everything you need to know, including guidance on registration and preparation, can be found on the ELAT and MLAT pages. If you have a piece of written work in English that you think would be suitable for both subjects, please send us two copies of this piece of work; you do not need to submit two different pieces of work in English. Successful candidates will have an aptitude for their modern language, or for linguistic study if they are picking up a new language from scratch, will read widely and will enjoy writing and talking about literature and language. Candidates who are shortlisted may be asked to talk about a piece of prose or verse supplied before or in their interview. For more detail on the selection criteria for this course, please see the English and Modern Languages websites. Graduates in English and Modern Languages go on to careers in fields including broadcasting, publishing, teaching, journalism, the theatre, administration, management, advertising, translation, librarianship and the law. Knowledge of a modern language opens up opportunities for internationally-focused careers and working with international companies or organisations. Please note the different course codes for Czech, Beginners’ Czech, Italian, Beginners’ Italian, Modern Greek, Beginners’ Modern Greek, Portuguese and Beginners’ Portuguese.